Short crust pastry and puff pastry are not the same thing. Though they do look awfully similar when they’re frozen. People who have grown up down under probably know that. I should probably know that too, but that doesn’t mean I do. They should have easy Americanized definitions on the label, like short-crust = sweet, puff = savoury. I suppose the picture of sausage rolls on the front should have been a clue, but my brain was in a different place. 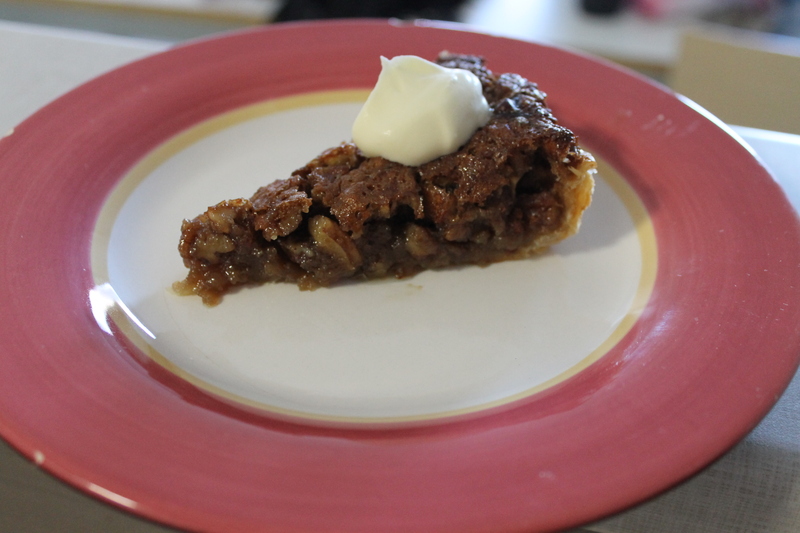 Despite pastry problems in the kitchen the pie turned out to be pretty tasty. 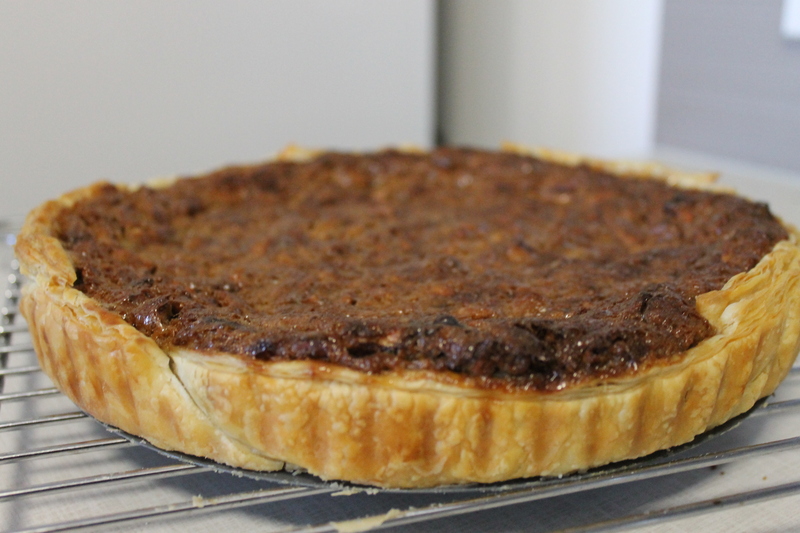 Pecan pie isn’t seen that often in Australia, but it’s not too difficult to make and it’s super sweet and delicious. As a side note, the egg in this recipe will cause the pie to rise pretty high while cooking, don’t worry, it won’t explode. I already did enough panicking for you. Once the dough has defrosted a bit, lay it into a 9-inch pie pan and trim the edges, leaving about an extra inch hanging over the edge. Tuck the overhanging dough underneath itself to form a thick edge that is even with the rim. Flute the edge as desired. Set separate racks in the center and lower third of oven and preheat to 200 degrees C. Put a piece of parchment paper or foil over the pie shell and fill with dried beans or pie weights. We didn’t have either so we used old uncooked ramen, it works as well. Bake on a baking sheet on the center rack until the dough is set, about 15 minutes. Remove from the oven and lift sides of the parchment paper to remove the beans. 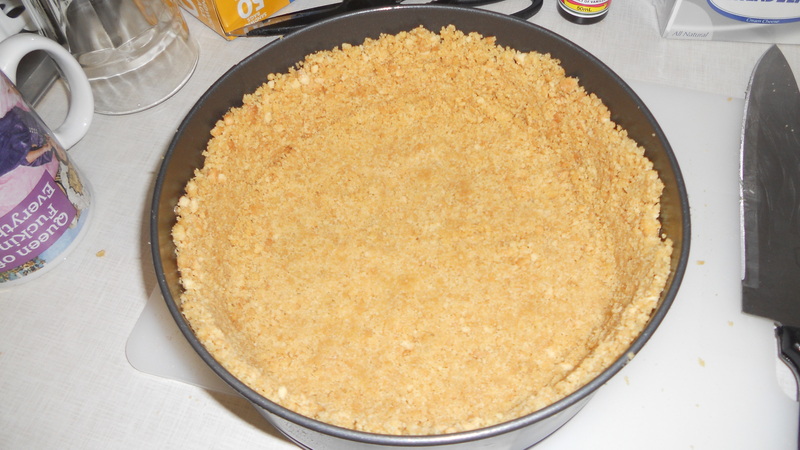 While the crust is baking make the filling: In medium saucepan, combine the butter, brown sugar, corn syrup, and salt. Bring to a boil over medium heat, and stirring constantly, continue to boil for 1 minute. Remove from the heat and stir in the nuts, bourbon, and the vanilla. Set the mixture aside to cool slightly, about 5 minutes. (If the crust has cooled, return it to the oven for 5 minutes to warm through.) Whisk the beaten eggs into the filling until smooth. Put the pie shell on a baking pan and pour the filling into the hot crust. Bake on the lower oven rack until the edges are set but the center is still slightly loose, about 35 to 40 minutes. (If the edges get very dark, cover them with aluminum foil half way during baking.) Cool on a rack. Serve slightly warm or room temperature with a dollop of cream on top. Cheesecake is one of those things that can actually feed your soul. As dumb as that sounds I really believe it is impossible not to feel happier after eating a bite of perfectly creamy, delicious cheesecake. The other day was one of those days where things seemed to be piling up and weighing down on my shoulders without reason or warning. To cure this and make that stress load feel a little lighter I decided to ditch studying for the day and bake a cheesecake instead. And it was a great idea. The other day my roommate made a Japanese cheesecake which was a new experience for most of us, it was delicious but it wasn’t the kind of cheesecake I am used to. 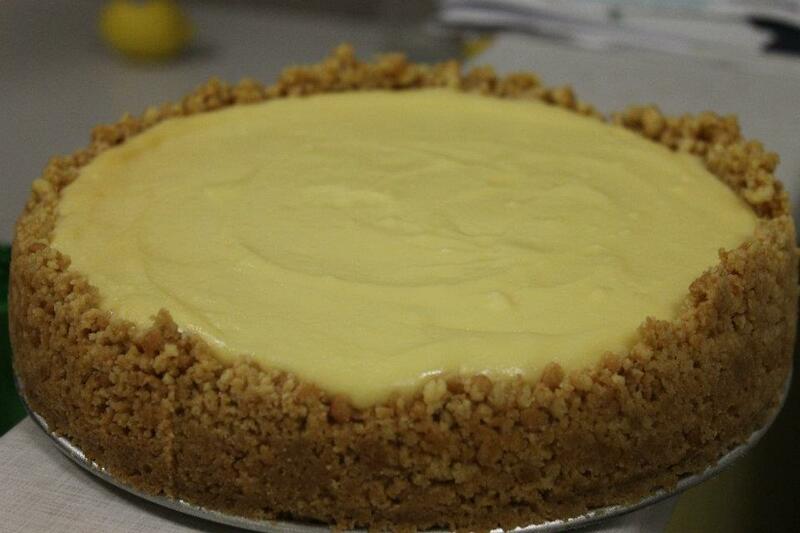 It’s never good when eating cheesecake makes you yearn for even more cheesecake. Isn’t it supposed to be a very special treat that you have once every few months and have to savor and dream about until the time comes round again that you can justify eating heaps of sugar and cream cheese and biscuits? I decided to ditch that common sense and instead declared it Cheesecake Week in Apartment 1834. And I headed off to the supermarket to buy my supplies. As I’ve said before baking is never the cheapest option for a student but this recipe wasn’t too bad, I also was missing a few necessary tools but I made do with what I had and everything turned out fine. First of all, make sure all of your ingredients are on the counter on your workspace so that they will be room temperature when you use them. Preheat oven to 160°C. 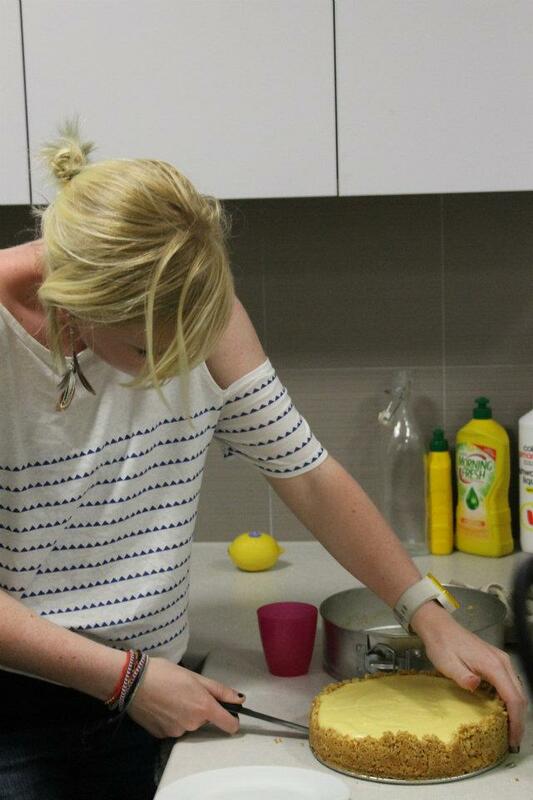 (I was using a fan forced oven so I lowered it to about 145°C because apparently you’re supposed to do that). Grease the inside of a 23cm springform pan with butter or Pam. 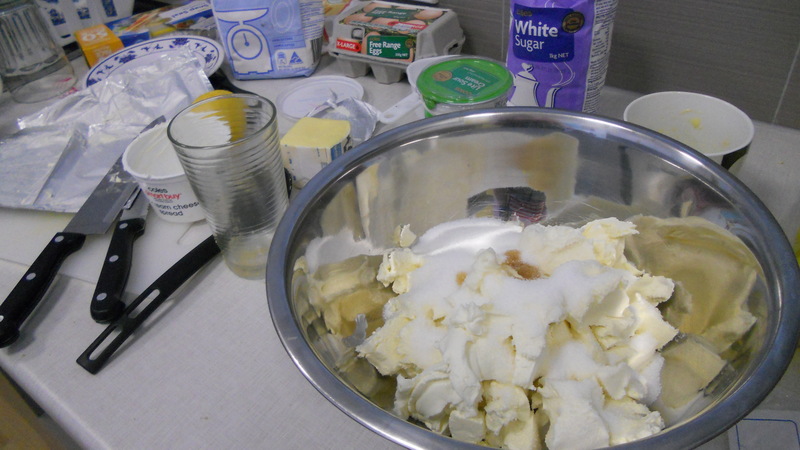 Add the butter and process (or just stir with a spoon) until well combined. Transfer to the pan. Use a straight-sided glass to spread and press the biscuit mixture firmly over the base and side of the pan, leaving 1 cm at the top of the pan. Cover with plastic wrap and place in the fridge for 30 minutes to chill. Meanwhile, use an electric beater to beat the cream cheese, sugar, vanilla and lemon rind in a large bowl until just combined. (I also don’t own a grater, which I really should because it’s quite practical, but I decided not to spend the $4 at the grocery store out of principle, for some reason I thought it would be horrendous to spend an extra $4 on this cheesecake, anyway, I just used a sharp serrated bread knife and basically grated the rind off the lemon that way, it was pretty successful except for the fact that it took quite a while, I would probably recommend just buying a grater, the one at the supermarket was even on sale when I went, I don’t know what I was thinking.) 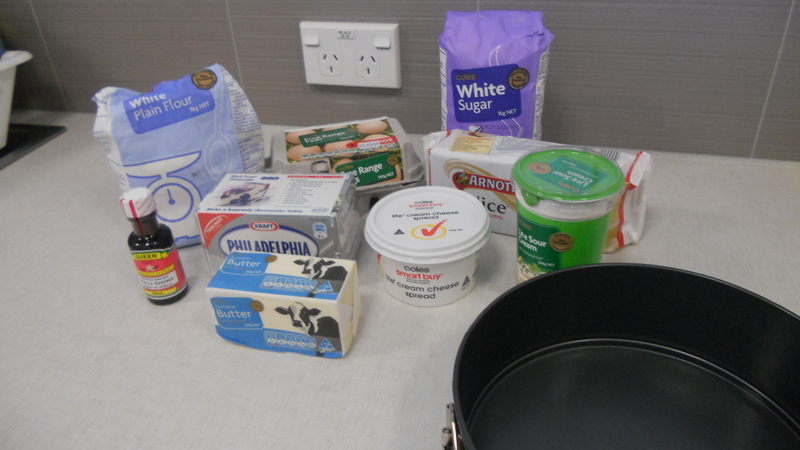 But to get back to the recipe, beat the flour into the mixture. Add the eggs, 1 at a time, beating well after each addition until combined. (But make sure you don’t beat too much since you’re not supposed to overbeat the cream cheese or it’ll get too many airpockets.) Stir in the sour cream until just combined. Turn the oven off. 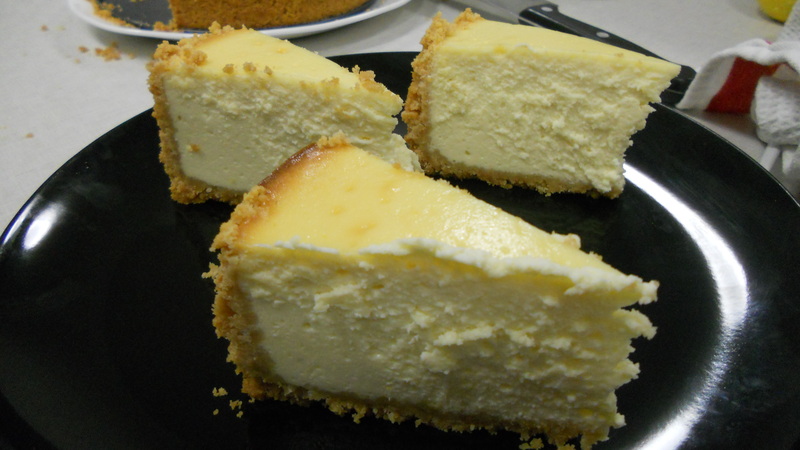 Leave the cheesecake in the oven, with the door ajar, for 2 hours or until cooled completely (this will prevent the cheesecake from cracking). Place in the fridge for 4 hours to chill. (Though good luck keeping hungry roommates away for that long). Enter your email address to follow Bacon Sprinkles and receive notifications of new posts by email.